If Steve Ballmer runs the Clippers like he ran Microsoft, could this be far off? 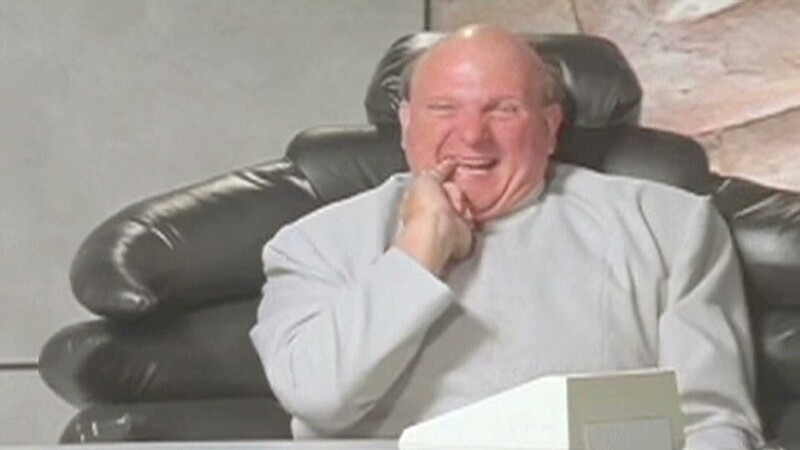 Congratulations on Steve Ballmer taking over your team! You should consider this really great news, particularly if you think the Clippers need someone to do the Monkey Boy dance to take them to the next level during crunch time. Cue Gloria Estefan: Get on your feet! Do you think the reason the Clippers were ousted from the playoffs had anything to do with coach Doc Rivers' inability to deliver a great locker room speech? Never mind that now! Substitute competitors for developers and Ballmer's got it covered. "Be competitors! Competitors, competitors, competitors, competitors, competitors, competitors, competitors, competitors, competitors.... [heavy breath] YES!" At Microsoft (MSFT), Steve Ballmer had a penchant for renaming things that just weren't working. Windows Mobile became Windows Phone. Hotmail became Outlook. Ballmer's renaming expertise could pay off really well for the Clippers. How about the LA Softies? The LA Vistas? Or, wait, we've got it: The Los Angeles "Clippies!" Imagine being greeted at the Staples Center by an amiable paper-clip-shaped personal assistant: "It looks like you're trying to find the concession stands. Are you looking to buy a personal hot dog or a business hot dog?" See, you're feeling better already, aren't you? The team will undoubtedly improve under Ballmer's tenure as owner too. Like Microsoft's famous "stack ranking" system, Ballmer will gather the players up by position and have them compete against one another in a series of skill drills. If Hedo Turkoglu beats Blake Griffin at a three-point contest? Griffin would clearly have to be labeled an "underperformer" and get his bags packed. See ya, Blake! Good luck on the Lakers! And Ballmer's Clippies will surely be the most innovative team in the NBA. Microsoft under Ballmer was adept at spending billions of dollars to develop technology well ahead of its competition. Microsoft built an e-reader way before Amazon (AMZN), a tablet years before Apple (AAPL) built the iPad and a touchscreen before the iPhone. But, like any good innovator, Microsoft let the competition try the technology out for years and years to work all the bugs out before it came to market. So you can expect the Clippies to gather a group of the most experienced big data crunching basketball gurus in the world. And in 2025 or thereabouts, they'll put their technology to the test. Ballmer will also market the Clippies better than anyone in the business. 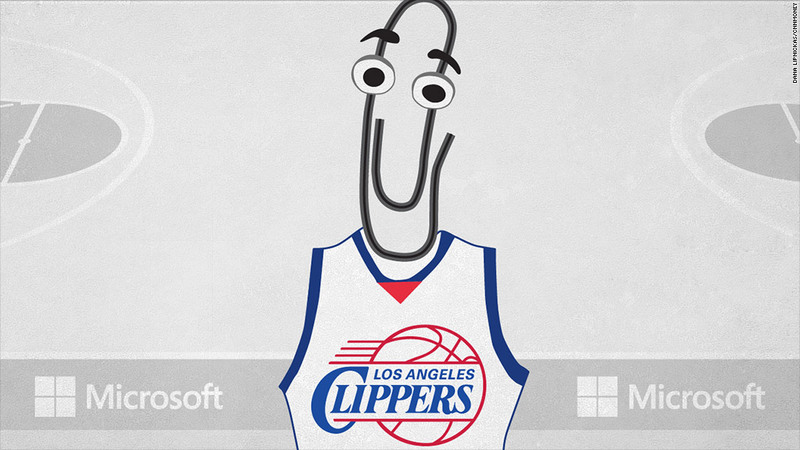 If the 2015 Clippers make a trade, Ballmer will announce that they're now the 2015 Clippies Update 1. If they make a big trade, They'll be the 2015 Clippies Service Pack 1. And if they roll out roughly the same team in 2016, they can just be the 2015 Clippies R2. Brilliant! Think of how much better things will be for the Clippies next year: The players will listen to Zunes during warmups and concession stands personnel will be replaced by Cortana. And, like Microsoft, the team will go through a major restructuring every few years where Ballmer will remain on top, but the general manager and coach will be fired. Oh, wait, that's actually par for the course in the NBA. See? Ballmer's a natural! Although maybe new Microsoft CEO Satya Nadella will need to buy the team in 2028 ... and move it to Seattle.